The secretary of the embassy moved out of the main house and into the West Pavilion in the 1820s and the chancery offices, it may be assumed, moved with him. This building was worked on again in the 1840s. By the 1890s, the chancery and consular offices in it were impossibly over-crowded. 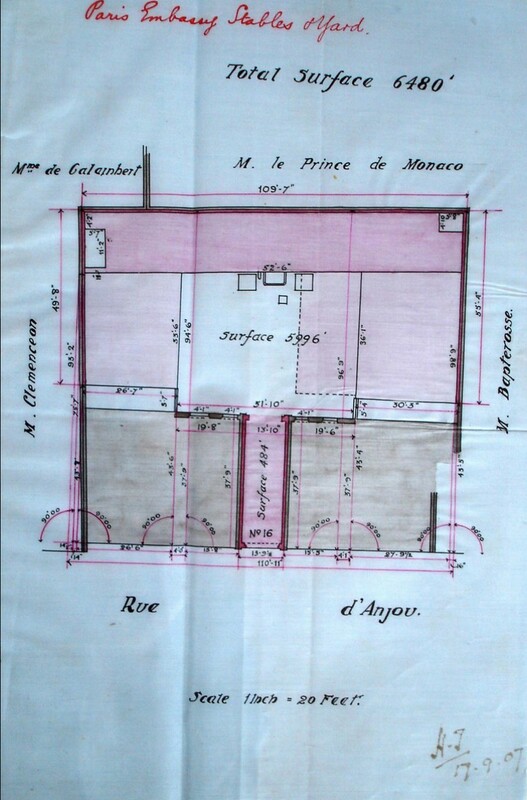 In 1898, the consulate became the first embassy offices to be accommodated away from 39 rue du Faubourg St Honoré when the consul was given an increased allowance to rent a house nearby that was large enough to include the consulate. After the First World War, other sections of the embassy moved into nearby leased premises: by the 1930s, the Services attaches and the financial adviser were in 3 Rue d’Aguesseau, the Passport Control Office was at 16 Avenue Hoche, the consulate-general was by then in its own offices at 19 Rue de Lisbonne, the Office Britannique de Tourisme was on the Champs Elysées, and the offices of the British Railways in the Boulevard de la Madeleine. There was every reason to bring some, if not all, of these sections together in a single respectable building. 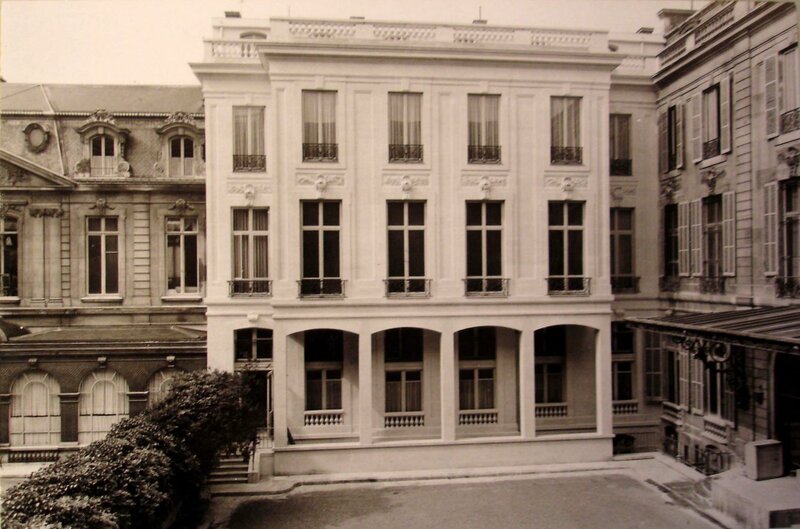 The ideal opportunity arose in late-1937, when the house adjacent to the embassy on the east side, 37 rue du Faubourg St Honoré, was offered to the ambassador, Sir Eric Phipps, by its owner, Jacques Pereire. His house was built by the architect Grandhomme in 1713 as one of a mirrored pair (the other is now the Cercle de l’Union Interalliée). It was bought in 1855 by Emile and Isaac Pereire, brothers who had made a fortune in railway development and property speculation, who rebuilt and decorated it in keeping with the taste of the time and their new status – in other words opulent style pompier. These works were completed in 1859 but financial disaster overtook the Pereires when their Credit Mobilier crashed in 1867. Both brothers had died by 1880 but the building remained with the Pereire family. Phipps made a powerful case to London for buying the house. Patrick Duff, Secretary at the Office of Works, went to look at it. He said of the offices in the West Pavilion that there was ‘no exaggeration in the Ambassador’s description. The conditions have to be seen to be believed, and are in the highest degree discreditable’. But there were problems: the price was high at £100,000, servicing the interest would cost three times the present annual outlay on rents, and diplomatic expenditure was being squeezed by the rearmament programme. Alternatives were investigated, including lamentably misjudged proposals by George Howard Jones, an Office of Works architect, to build upon and around the pavilions. The debate was still dragging on, even though Pereire’s price was brought down to £65,000 and an anonymous donor had offered a contribution of £20,000, when war was declared in September 1939, and all proposals were shelved. 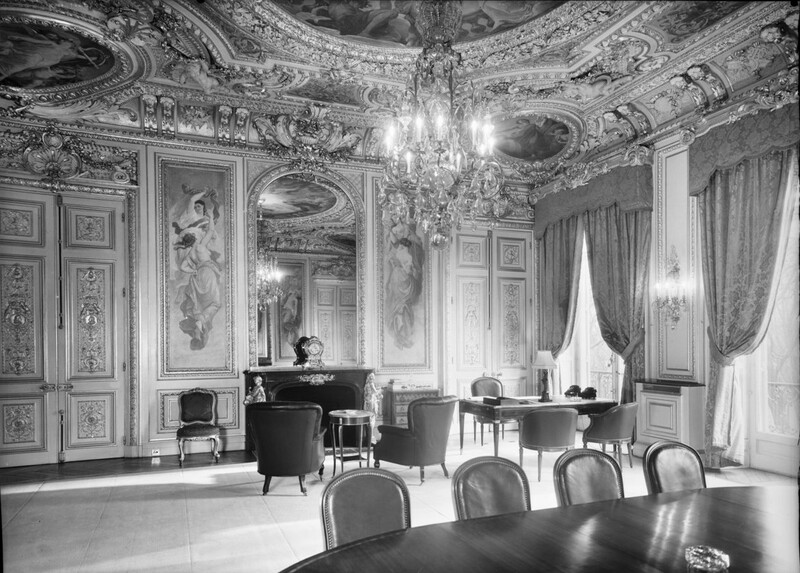 Within a month, the residence ballroom was being used day and night as offices for the press service, and Jacques Pereire played safe during the war by leasing his house at low rent to the Vichy Ministry of Youth. Within two weeks of his arrival as ambassador in September 1944, Duff Cooper re-opened discussions about buying the Pereire house and was authorised by London to ask the French authorities to requisition it for the embassy’s use. The French agreed, even though it apparently meant moving out 500 French officials, and said that the terms would be the same as the Free French were enjoying in London. The building was exceedingly dirty throughout, and numerous repairs were necessary. Given the scarcity of labour and materials in Paris, the Director of Labour in Rear Headquarters at Paris was persuaded to lay on a Section of Pioneers to clear up of the building, which took the dozen or so men several months. Pereire House was thereby brought into full temporary office use at the end of July 1945. After a year, it was proving sufficiently satisfactory to justify its purchase, restoration and adaptation to permanent offices. The ambassador suggested paying for the house in goods or military equipment but the Treasury, after due rumination, preferred normal financing. The sale was completed in August 1947 for £242,000, partly paid with francs held by the embassy’s Information Department that could not be repatriated. 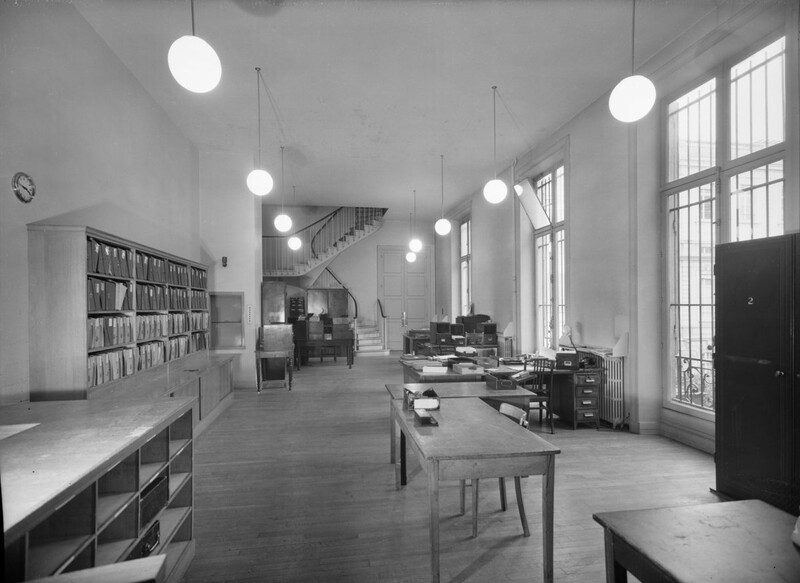 The Ministry of Works’ plans for the rearrangement of the building, estimated at £50,000, were shown to the Foreign Secretary, Ernest Bevin, for final approval. He was ‘not satisfied that the desired result can be achieved at all with the existing building and has expressed the provisional view that it be completely demolished and the ideal offices erected on the site’: failing that, he would want the adaptations significantly reduced. He was dissuaded from demolition, and a revised scheme was ready in December 1947, estimated at £65,000, to be carried out in stages over three years. This building programme was completed in 1951, when practically all the embassy offices were brought together into this one building. The West Pavilion became the head of chancery’s house, and the ambassador’s new office had a private door directly into his residence. By the early-1960s, even the Pereire offices were too small and there were debates about how extensively to rebuild them within their envelope. The outcome was to revert to a 1947 idea of building a strip of offices on each floor up the southern side of the Pereire courtyard. With the assistance of the locally retained architect, M. Gamba, plans were agreed in 1965, including by the neighbouring Cercle de l’Union Interalliée, and the extension was completed in 1967 at a cost of £83,000. It did not entirely meet the need for yet more offices but it helped. 2 rue de Miromesnil, third floor apartment, was bought for £37,000 for a counsellor in 1961 and sold in ????. 47 Avenue d’Iéna, first floor apartment, was bought for the economic minister in 1964 for £62,000 and was sold in 1986. 6 Villa Said, in the cul-de-sac of that name off Avenue Foch, was bought in 1973 for £217,000 as the residence of the ambassador to the OECD (who formerly lived at 67/69 Avenue Victor Hugo, fourth floor apartment). 3 rue Alberic Magnard bought in 1985 for ?? 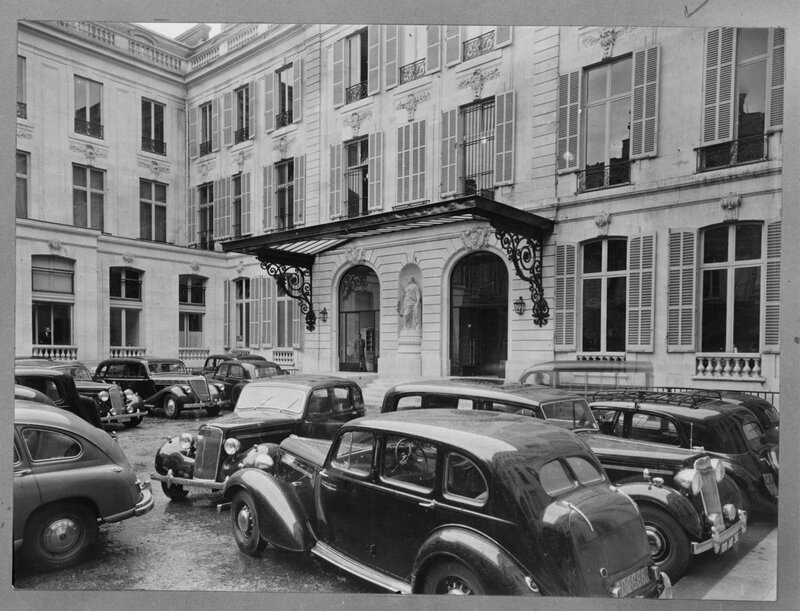 The British Government also nominally owned, since its purchase in 1890, the Hertford British Hospital, 48 rue de Villiers, but it played no part in its management which was the responsibility of a trust. Beal, Mary, and John Cornforth, British Embassy, Paris: the House and its Works of Art, London: Government Art Collection, 1992, (reprinted with amendments, 1996). Craig, Maurice J., Report on the British Embassy, Paris, Ministry of Public Building and Works, November 1958. Copy in TNA WORK10/578. Friedman, Joseph, British Embassy, Paris. The History of a House 1725-1985, four vols, and Catalogue of Bonaparte-Borghese Collection, two vols, 1986, for FCO, unpublished. FCO, Short History of the British Embassy, Paris, FCO (limited edition of 300 copies), 1990. Gladwyn, Cynthia, The Paris Embassy, London: Constable, 1986. Hussey, Christopher, The British Embassy, Paris, Country Life, July 4 and July 11 1957. Knox, Tim, The British Ambassador’s Residence in Paris, Flammarion, 2011. Middleton, Robin D., Her Britannic Majesty’s Embassy, Paris: an Historical Report, Ministry of Public Building and Works, 1961. Copy in TNA WORK10/580. Ronfort, Jean Nérée, and Jean-Dominique Augarde, À l’ombre de Pauline: la Résidence de l’Ambassadeur de Grande-Bretagne a Paris, Editions du Centre de Recherches Historiques, 2001. 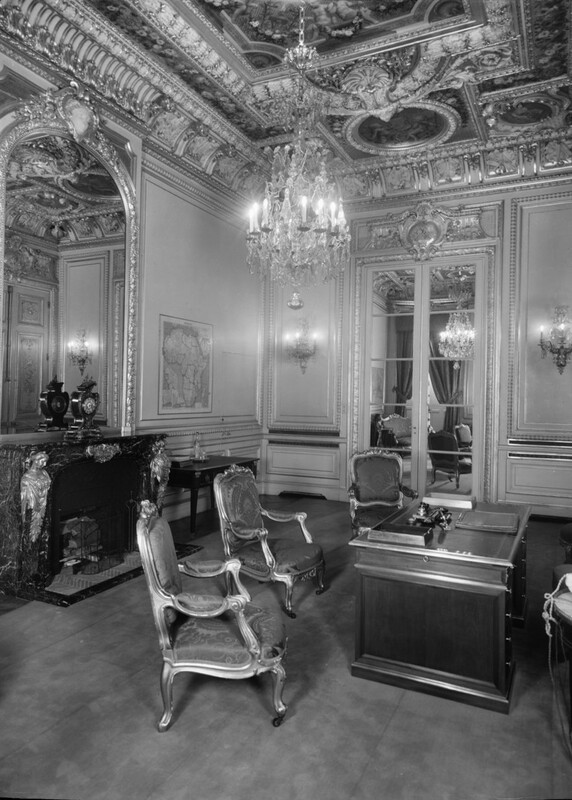 Ambassador’s office in Pereire House, 1952.
? Private Secretary’s office in Pereire House, 1952. New Registry in Pereire House, 1952. Courtyard of Pereire House, 1964. Skin of new offices facing north in Pereire House courtyard, completed 1967. 1907 record drawing of site of rue d’Anjou stables, showing access to rear of site between two pieces of land sold in 1863.